One of the greatest scientists living on the planet today, Stephen Hawking needs no introduction. With science geeks and the non-scientific population of the world, he is equally popular, widely known and often compared to scientists like Einstein and Galileo. 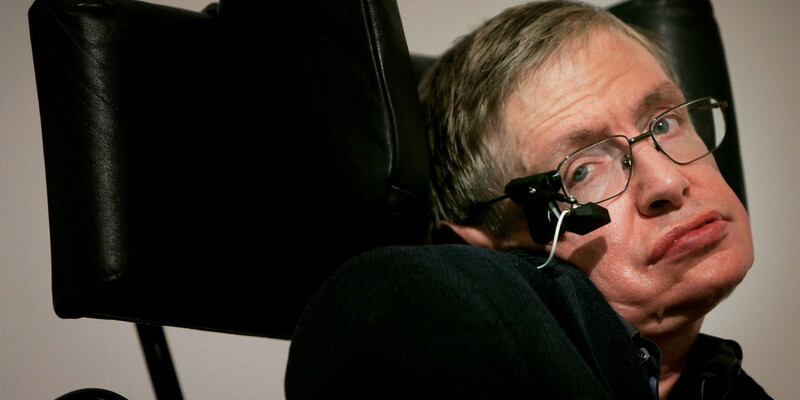 A theoretical cosmologist and physicist, Stephen Hawking is the director of research at the Centre For Theoretical Cosmology in the University of Cambridge today. Hawking is most popular for his theories in the field of cosmology, in which he uses Einstein’s relativity theory and quantum mechanics. His book, A brief history of Time in which he explains his cosmology theories in a very simple manner understandable by the layman had been the bestseller for a really long time of 237 weeks. This book was what made him more reachable to the non-scientific masses along with the fact that he makes constant guest appearances on popular TV shows such as The Simpsons and Star Trek. Stephen Hawking was born to the also-highly-educated Frank and Isobel Hawking both of who went to Oxford. His father Frank specialized in Medicine and Isobel, in Philosophy and Economics. Stephen, who was one among four of kids of the Hawking couple was surprisingly not very good at academics as he was at learning things in general. Although teachers often dismissed him off for his poor performance in academics, they knew that there was a hidden genius in him, which is probably why he was nicknamed ‘Einstein’ while in school. He was expected to take on the same path as his father in medicinal research but did not find biology interesting as he thought it was ‘too inexact’. Instead, he studied physics at University of Oxford and later, Astronomy and Cosmology at the Trinity Hall, Cambridge. During his days in Cambridge, Hawking was diagnosed with ALS (Amyotrophic lateral sclerosis) which would progress as he grew older. Today, he still communicates effectively despite the disease using a system known as the equalizer. Although he can only communicate with about 15 words per a minute because of his disease, he’s authored books, given lectures and written a lot of scientific papers. Stephen Hawking is also known for bearing the position of Lucasian Professor of Mathematics, a title previously held by Sir Isaac Newton. He had also won numerous awards and honours for his work. He had received nearly twelve honorary degrees and is a fellow of The Royal Society and a member of The US National Academy of Sciences. In 2009, President Obama awarded him with the highest honorary award, the Presidential Medal of Freedom award. Hawking in one of his speeches, famously said that the future of human race is in the outer space and not on the earth. He also thinks that space tourism should be supported. And if the day comes for something like that to happen, there will be one man who will be remembered even in the outer space. That would be Stephen Hawking.